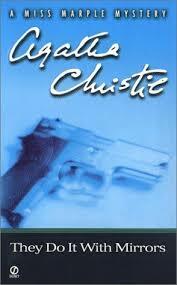 I like the simplicity of Agatha Christies writing while also the whole “whodunit” nature of her books. It was a simpler time when she wrote, so it’s understandable that I would be like “HAHA I know who did it!” When I’ve been raised to mistrust certain characters and been thrown off by the likes of Joss Whedon, George R. R. Martin, and that damn Gone Girl book and Before I Go to Sleep. Psychological thriller this is not. However, it was an okay book given that I understand that at the time, she was writing for the mystery aspect and trying to throw people off. She does a good job. It’s about a home that is a rehabilitation centre for delinquents and someone ends up dead. Interesting read if you are looking for fancy talk and a good mystery to curl up with in the fall. Allison Abate • This entry was posted in Mystery and tagged Agatha Christie, miss marple, they do it with mirrors. Bookmark the permalink.